Living on the West Coast, residents of Southern Vancouver Island are familiar with the wind storms that can cause damage to property and landscapes but we often forget the impact these storms can have on our local wildlife. On May 23, one such wind storm blew through Victoria and is believed to be the reason a young bald eagle fell out of his nest. A concerned citizen found the young bird in the grass behind the police and fire station on Monterey Avenue in Oak Bay. 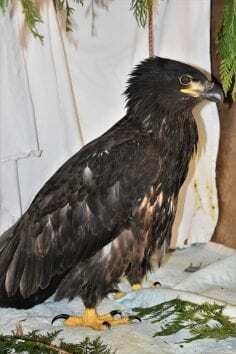 As bald eagle nests are built high in the tree tops, a fall from a nest can cause severe injury to young eaglets and so it was determined this baby bald eagle should be brought to a rehabilitation centre to assess his condition. 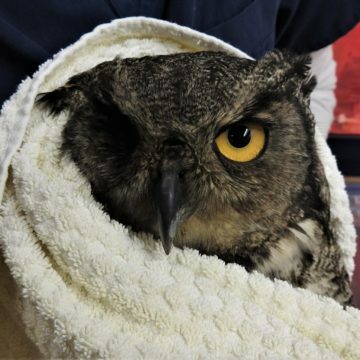 He was brought to Central Victoria Veterinary Hospital, which is used as a temporary drop-off point for injured, orphaned and sick wild animals awaiting transfer to the BC SPCA’s Wild Animal Rehabilitation Centre (ARC) – the only facility for Southern Vancouver Island. When he arrived at Wild ARC, the rehabilitation staff assessed the eagle’s condition and he was found to have no serious injuries. He did suffer some minor swelling in his left leg and a small amount of blood was found in his mouth. He was kept under close observation in an intensive care unit and given pain control medication for his leg, rehydration fluids, hydration therapy and was offered salmon and fresh water for sustenance. The eaglet quickly recovered from his tumble from the nest and regained full motion of his leg. Staff determined he was approximately eight or nine weeks old. Bald eagle babies generally fledge from the nest at around 10 to 13 weeks of age so the next question faced by Wild ARC staff was how to safely and responsibly reintroduce this young baby back to his family. Whenever possible, Wild ARC will attempt to reunite babies with their parents, but with bald eagles it is more complicated than just putting the baby back into the nest. Bald eagles reuse the same nest year after year but if the nest site is disturbed, they may abandon that nest for future years to come. To limit the disturbance to the nest, Wild ARC staff decided to wait until the eaglet was fully flighted before returning him to his family. Rehabilitation centres often work together to ensure the best possible care for the wild patients and Pacific Northwest Raptors in Duncan had a pair of bald eagles that were caring for their own baby eaglet at the time. 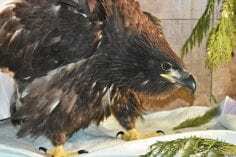 The young eagle from Oak Bay was transferred to the Duncan facility where the adult bald eagles were separated – the adult male was placed with his biological baby and the Oak Bay eaglet was fostered with the adult female. This was the best possible situation for the eaglet to be raised by foster parents until he was strong enough to fly on his own. 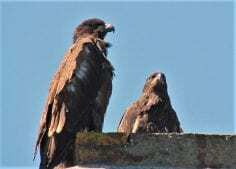 While the adopted eaglet was being well cared for by the adult female in Duncan, many concerned residents of Oak Bay were keeping a close eye on the original nest. There were actually two babies in the Oak Bay nest and these avid bird watchers were tasked with monitoring when the eaglet’s sibling began to fledge as this would indicate the correct time to reintroduce the eaglet back with his family. On June 16 the young eaglet was brought back to Oak Bay near his original nest site and released. With a crowd of interested onlookers, the eaglet flew in a low circle before disappearing behind a stand of trees. He was spotted again with his sibling just a few days later perched on rooftops and flying near the nest site. The logistics of rehabilitating wild animals can often be complex and this story is a great example of the cooperation needed between members of the public and rehabilitation centres to ensure the health and safety of our local wildlife. Don't have email? Don’t worry! Call us at 1-800-665-1868. Want to help us, help animals? There are many ways to support our work in wild animal rehabilitation. 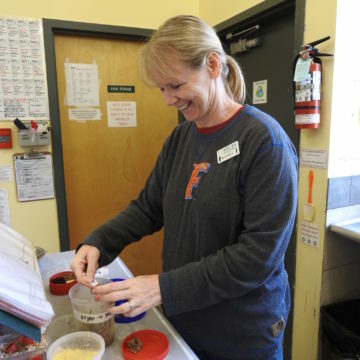 Find out all the ways you can volunteer to help wildlife at Wild ARC. 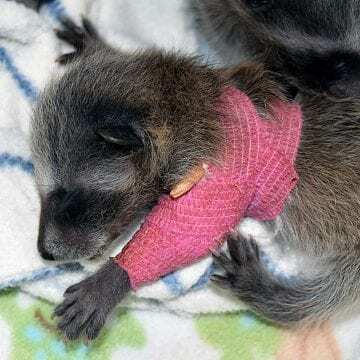 Have you found a sick, injured or orphaned wild animal?